Steel drawer cabinets are used every day yet not much thought is given to them, so we are going to go a bit more in depth with their uses. 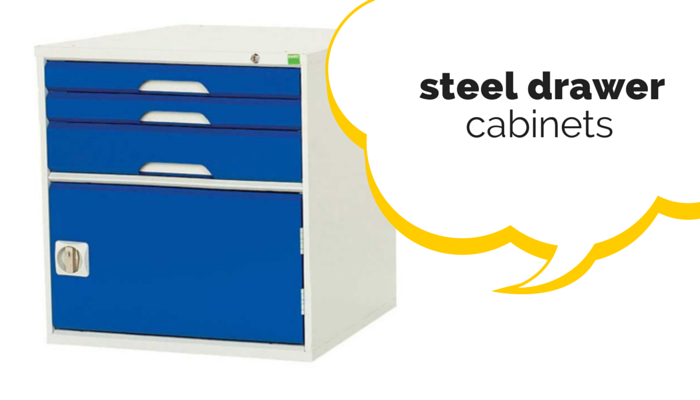 These are great for warehouse, workshops, garages and anywhere else where smaller items, parts and components need to be stored safely and efficiently, there is more than one type of steel drawer cabinet so we take a look at what is available. These extra wide steel drawer cabinets are ideal when space is at a premium, especially in workshops or warehouses where most space is taken up by stock. Because of the extra room you can utilise the cabinet accessories for a super organised unit which will offer easy access and versatility. Depending on your requirements there is a vast array of configurations available to suit a number of uses and industries. With a vast array of accessories available they can transform your drawers into component holders, filing systems or tool cabinets. Moulded inserts – provided segregated cavities which can be used to store items of varying sizes. Useful for garages and workshops. Sub dividers – These are designed to quickly and easily change the use of your drawer cabinets and maximise space. -	Slotted dividers – Ideal for creating smaller compartments within drawers, which is perfect for storing smaller items or components. Drawer divider sets – If you are not sure what configuration you will need you can order sets which offer different sized compartments. Anti-slip inlays – These inlays stop items rolling about and potentially getting damaged, quick and easy to install. Cabinet tops – Some of the cabinets offer even more personalisation with cabinet tops such as beech or lectern tops.